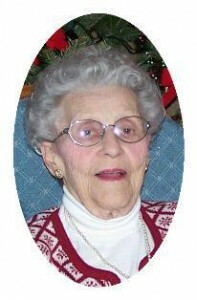 Harriet R. Fedder, 89, of S Garfield Avenue in Port Washington died Tuesday, January 3, 2012 at her residence. She was born March 26, 1922 in Grafton, Wisconsin to John and Ann Schreiner Dickmann. She married Frederick H. Fedder of Port Washington, Wisconsin on June 26, 1943 at St. Joseph’s Church in Grafton, Wisconsin. They moved to Milwaukee and raised a family. Later they moved to the lakefront in Port Washington and Grafton before settling in their Garfield Avenue home in 1956. She worked at a cookie factory while in Milwaukee and later as a yarnwinder at the Grafton Woolen Mill. Above all she was a proud homemaker. Her husband Frederick preceded her in death August 2, 1980. Harriet was a member of the St. Mary’s Christian women and will be remembered for her cooking and baking skills. She enjoyed latch hooking, embroidery, country music and spending time with her grandchildren and great grandchildren. She is survived by her children Rosemary (Paul) Buser of Port Washington, Frederick (Cheryl) Fedder, Jr. of Saukville and James Fedder of Port Washington. Further survived by grandchildren Steve, Jay, Missy and Andy, great grandchildren Autum, Megan, Jake, Annabelle, Samantha and Carson, sisters-in-law Alice Dickmann of Grafton and Doris Bengston of Sturtevant, nieces, nephews, other relatives and friends. Preceded by brother Jerome Dickmann and Melvin Dickmann and brother-in-law Clifford Bengston. Rev. Thomas Lijewski will celebrate Mass of Christian Burial 6 pm Friday, January 6, 2012 at St. Mary’s Church, Port Washington. Interment parish cemetery. Visitation 3 – 5:30 pm Friday at the funeral home. Memorials to St. Mary’s Church appreciated.